The Scoliometer by Spiral Spine allows users with scoliosis to measure their ribcage and vertebral rotation. By using the app regularly, users can determine which therapies decrease their spinal rotation. This Scoliometer may also be used to determine whether scoliosis may be present. The Scoliometer by Spiral Spine quantifies the rotational aspect of scoliosis and pinpoints the highest degree of rotation for each curve. By measuring the spinal rotation before and after different exercise and spinal therapy sessions, users can determine if the body responded favorably to that session, and to what degree (through a decrease in rotation and a lower Scoliometer degree reading). 1. 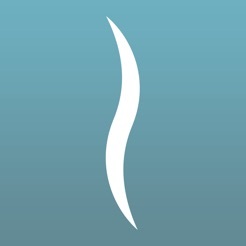 The person with scoliosis stands in front of the person holding the mobile device with the Scoliometer app. 2. The person with scoliosis slowly reaches their hands towards the floor, bending forward through the back. 3. The person with Scoliometer app pulled up on their mobile device puts their thumbs under either side of the phone while looking at the app. They rest their thumbs on either side of the spine and slide the phone down the person’s back in front of them while they roll down. Not sure if you have scoliosis? Get the app to find out if your spine has rotation. If your readings show that rotation is present, make an appointment with your doctor to confirm if scoliosis is present. 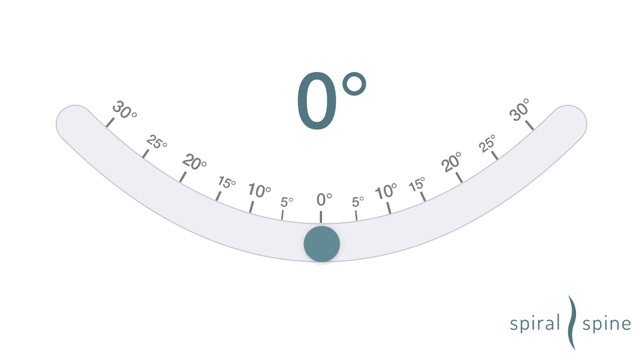 Then, use the Scoliometer regularly to track your rotation. This is a straight-up scoliometer, no crazy bells and whistles to distract the user. If you’re serious about tracking your scoli, this is by far, the easiest to use.